Microsoft Bids 44.6 Billion in Cash and Stock to Buy Yahoo! Here is the press release announcing a half cash / half stock offer. Microsoft Corp. today announced that it has made a proposal to the Yahoo! Inc. Board of Directors to acquire all the outstanding shares of Yahoo! common stock for per share consideration of $31 representing a total equity value of approximately $44.6 billion. Juicy bits from the press release, which contained a letter to the board of Yahoo! Yahoo! killed off their brand universe project, and recently fired 30 people. Rumor has it that about 2,000 more layoffs might be coming soon. Yahoo! shares are nearing $20, trading at $20.78, and giving them a market capitalization of $27.8 billion. This WSJ article highlights that about half of Yahoo! 's value is in cash and equity stakes in Alibaba and Yahoo! Japan. Over the last year Yahoo! lost significant momentum and marketshare in search. They need to outsource search and search ads, fire a bunch of employees, gain search marketshare, or there is going to be a buyout or merger before the year is out. Sidebar: to anyone hyping the value of pageviews and social media, think of how many pageviews Yahoo! has. If you pull out the value of Yahoo! 's large equity stakes in other companies and cash on hand, Amazon and eBay are each worth about 2 to 3 times Yahoo!, and Google is worth about 13x. Increase the relevancy of their directory by actually featuring it (the directory looks like a sidebar to a blog that occupies most of dir.yahoo.com), and by becoming more selective with what sites they accept. You can appreciate their bad marketing of the Yahoo! Directory by the fact that the Google Directory (a DMOZ clone) has a higher PageRank. Yahoo! is testing integrating Del.icio.us data in their search results. Brand Yahoo! search as human edited safe search and find a way to pay end users for their contribution. Payment does not need to be monetary. Take a look at the success of Yahoo! Answers and Del.icio.us and apply those toward search. Google gives Checkout advertisers free ads and a higher ad CTR (which leads to a lower ad cost). Win search marketshare from your users by giving them rebates on your other products as well. Create a branding and awareness campaign around the new Yahoo! Search. Hire someone to do a fake study proving that Yahoo! Search is more relavant than any of the other players. Make sure Ask or Microsoft is ranked #2 ahead of Google. Let users comment on search results AND on listings in search results. Controversy surrounding this will lead to more people talking about and evaluating Yahoo! Search for quality. Launch a new toolbar with a meter like PageRank in it...call it YourRank (or something the emphasizes to the user) that it is their web and what they like. Heavily push that branding message to users locked into Yahoo! email, Yahoo! Stores, and other verticals they interact with. Create a well branded specialty search for bloggers with innovative features that make it easy to follow the conversation both ways. Also launch creative ideas to buy mindshare with other high authority communities (universities, open source projects, etc.). Easily allow advertisers to do keyword research on Yahoo! outside of while they are setting up search campaigns. Create a reliable publicly accessible keyword tool which actually markets the Yahoo! Search product. Give away a lot of useful search market data (like Microsoft recently did with their Ad Intelligence plug-in). Put the Yahoo! brand on the millions of syndicated domain landing pages they power each day. How Could Yahoo! Become Relevant? Do you still use Yahoo! Search? What could Yahoo! do to make you want to use them and talk about their search product? "The market's extraordinary trading volume caused a delay in the Dow Jones data systems," said Dow Jones spokeswoman Sybille Reitz. "We decided to switch over to the backup system, and the result was a rapid catch-up in the published value of the Dow Jones industrial average." Spokesmen for the NYSE Group Inc. and Nasdaq Stock Market Inc. could not immediately confirm whether all closing share prices were valid. A spokesman for the Big Board said it experienced "intermittent delays and are currently assessing the situation." The Nasdaq said it was "confirming" the closing numbers. I think market glitches like these also relate to SEO and marketing. The more reliant you are on any one source / technique / strategy the more often you run into glitches and the harder they hit you. I think understanding the web and how search interfaces with other business models allows you to know many markets better than the market does. The hard part is investing without emotional attachment or greed. Read more about the drop. Recently Miva announced that they were dumping a partnership with Yahoo! in favor of distributing Google ads. MIVA said in its papers that it will adopt Google advertisements on applications and sites managed by its subsidiary, MIVA Direct, which produces white-label toolbar and Web search. The deal, which will run for two years and has "broad termination rights," will begin within 30 days. The market responded by bidding Miva's stock from $3.40 up to $4 a share. What does that mean to marketers? If a small ad network makes more profit redistributing the ads of a large player than selling ads directly they probably don't have much value in their advertising product. This is why increasing the efficiency of your AdWords account by 10% is worth far more than trying to find under-priced clicks from 50 pay per click search engines you never heard of. The second interesting thing worth noting from the market reaction to the Miva / Google partnership is that if changing from Yahoo! to Google increases the value of the company by 15% that shows how efficient Google's ad platform is compared to Yahoo! 's or that the stock market just loves Google...either way, it is going to keep smaller public companies favoring partnerships with Google over Yahoo!. It also shows the strong consolidating trend amongst ad networks. If Google is worth 15% more than Yahoo! then they are probably 40% or 50% more than Microsoft, and as monetization rate drops off there is no reason for anyone syndicating search and contextual ads to look far beyond the top few players. The search market is also going to parallel the ad market. Google's ad network is so strong because they own so much of the search market. If you can get a few more high quality editorial links that will boost your authority in Google that is worth far more long-term than picking at the edges gathering hundreds of low quality links which may hurt the stability of your rankings. Lots of money is being spent on new ad network start ups which largely duplicate one another. Networks that are able to deliver real tangible value and get enough media exposure to become synonymous with their ad or media type will thrive while most will fall to the fate of a Miva or a Looksmart...a legacy network with random bits and pieces which makes more redistributing someone else's ads rather than by innovating and selling their own ads. Google is already getting a foothold in print, audio, and video ads. 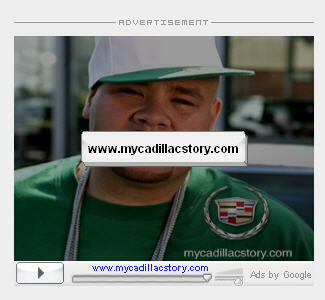 I just saw a Fat Joe Cadillac Escalade AdSense video ad on this page, pointing to a site called MyCadillacStory.com. That is pretty slick and streamlined for how new Google's video product is. The race to create an ad network and buy distribution has changed to a race to create toolbars, applications, software, communities, and plugins that allow people to redistribute ads. Even some password applications (such as Roboform) have search built into them, and Google Custom Search Engine makes it easy for anyone to get paid syndicating Google results (or a biased subset of them). Will Yahoo! Shares Bounce Back? It seems a large part of the reason that Yahoo! 's stock recently tanked was the market was punishing them for delaying their ad system. I know factoring clickthrough rates into ad costs will help optimize their revenue stream, but does anyone think the new system will help them catch Google on the monetization front? They are losing marketshare daily. Google has a stronger search technology and search related brand, and the next version of IE is going to integrate search into the browser. Even if MSN loses most of the associated browser distribution deals they will still drive up the traffic acquisition costs for those who win them, and since Yahoo! has a less efficient marketplace than Google they are not going to be able to outbid Google. Google is already busy taxing noise out of their ad network when Yahoo! is just fighting to keep up with pricing, let alone creating easy account management tools. Yahoo! is more cautious with trademark protection in search ads. Since branded terms are some of the highest converting and most valuable terms that choice probably costs them a fat packet of cash. Google up in regular trading due to speculation that it may be added to the S&P 500 index after the PG purchase of Gillette (now with 5 blades) goes though, but instead S&P announced home builder Lennar is to be added. In spite of the two recent hurricanes the third quarter was the best so far this year for the US stock market. Bill Miller does not think the US deficit matters, but the consolidation of wealth at the cost of the whole leads to social illnesses like political corruption. Meanwhile, Larry is sitting on a fat billion as Google partners with NASA & the internet conglomerates gear up for the big battle ahead. eBay, Yahoo!, & Amazon are each up a couple points in the last couple days.